In order to identify novel mutations affecting mechanosensation, we designed an assay that measures the behavioral response to tactile stimulation of fly bristles in mutant clones generated by the MARCM method. The combination of techniques allows for the identification of mechanosensitive mutations that would otherwise be lethal. Murphy, T. P., Luu, D. D., DeSimone, J. A., O'Brien, T. C., Lally, C. J., Lindblad, J. J., Webster, S. M. A Behavioral Assay for Mechanosensation of MARCM-based Clones in Drosophila melanogaster. J. Vis. Exp. (106), e53537, doi:10.3791/53537 (2015). Because of the structural and functional homology to the hair cells of the mammalian inner ear, the neurons that innervate the Drosophila external sense organs provide an excellent model system for the study of mechanosensation. This protocol describes a simple touch behavior in fruit flies which can be used to identify mutations that interfere with mechanosensation. The tactile stimulation of a macrochaete bristle on the thorax of flies elicits a grooming reflex from either the first or third leg. Mutations that interfere with mechanotransduction (such as NOMPC), or with other aspects of the reflex arc, can inhibit the grooming response. A traditional screen of adult behaviors would have missed mutants that have essential roles during development. Instead, this protocol combines the touch screen with mosaic analysis with a repressible cell marker (MARCM) to allow for only limited regions of homozygous mutant cells to be generated and marked by the expression of green fluorescent protein (GFP). By testing MARCM clones for abnormal behavioral responses, it is possible to screen a collection of lethal p-element mutations to search for new genes involved in mechanosensation that would have been missed by more traditional methods. Humans rely on the ability to convert mechanical stimuli from their environment, such as touch, pressure, vibration, or sound waves, into sensory information that can be processed by the nervous system, in a process termed mechanotransduction. Many of the overall mechanistic features of mechanotransduction between humans and invertebrates are the same1, making Drosophila a useful model to study the molecular mechanisms of mechanotransduction. Drosophila melanogaster contain two sets of specialized sensory organs (Type I and II) that are capable of converting mechanical stimuli into action potentials. Type I mechanoreceptors have a neuron with a single dendrite or sensory process, surrounded by three support cells2. The Type I mechanoreceptors include bristle mechanoreceptors, hearing sensitive chordotonal organs (the Johnston's organ), and campaniform sensilla that convey information about wing beats3. The bristles that cover the dorsal side of the fly are the most abundant and easily accessible of the Type I organs. Similar to the extracellular environment of hair cells associated with hearing and balance in vertebrates, the support cells surrounding fly mechanosensitive neurons secrete a high potassium endolymph that creates an unusual concentration gradient for potassium1. Mechanosensitive neurons, of both the mammalian and fly systems, utilize this high extracellular potassium to depolarize the cell. In response to mechanical stimulation of the macrochaete bristles towards the body wall, the sensory neurons respond with a burst of action potentials driven by this potassium depolarization of the cell membrane4. The Drosophila sensory neurons that innervate bristles resemble the mechanosensitive cells of other organisms, including vertebrate hair cells, in both structure and function1,5. The accessibility of Drosophila external sense organs to experimental manipulation and the abundance of genetic techniques available to researchers make Drosophila an excellent model system to investigate the molecular underpinnings of mechanosensation. In the fly, stimulation of a single sensory neuron that innervates a bristle leads to an observable behavioral response. Stimulation of different bristles evokes specific, reproducible behavioral responses, depending on the bristle that is stimulated. Upon tactile stimulation, decapitated wild-type flies exhibit a complex grooming reflex wherein they clean the area near the stimulated bristle with a patterned set of leg movements5-7. When homozygous for known single-gene mutations that interfere with learning7 or coordination and locomotor activity5, flies respond abnormally to mechanical stimulation. This grooming reflex is therefore a useful tool to study the effects of single-gene mutations on a specific, replicable behavior. The robust behavioral response to stimulation of a single macrochaete bristle holds the potential to assist in identifying new genes involved in mechanotransduction. 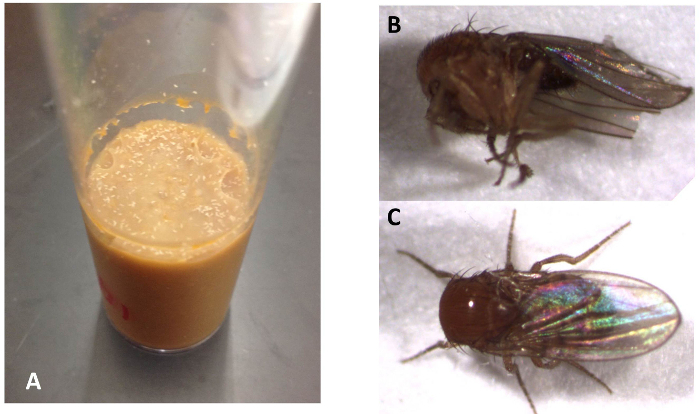 This protocol being used to test a collection of mutant flies for the absence of a behavioral response to indicate that the mutation interferes with mechanosensation. In the mutant collection selected for screening, the mutations cause lethality before adulthood, and therefore would be impossible to test using traditional adult behavior screens. Originally, this collection of lethal p-elements was combined with FRT recombination sites to test cell growth defects in clones. 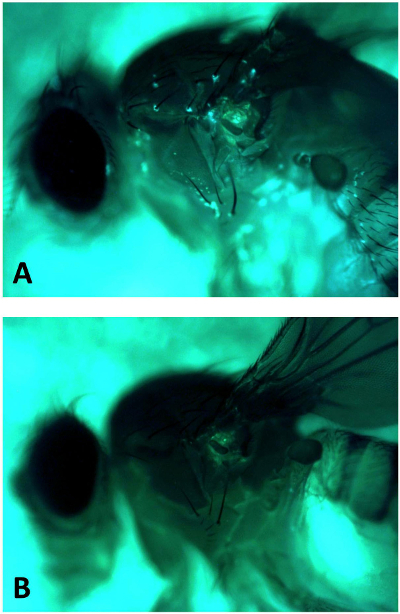 The clones were made specifically in the eye because adult flies can survive in the lab setting without functional vision8. However, removal of all mechanosensation can cause adults to be severely uncoordinated or die before eclosion5. This protocol uses a mosaic approach to circumvent the lethality of the mutations and allow for adult stage testing. A genetic technique called Mosaic Analysis with a Repressible Cell Marker (MARCM)9 is used to generate homozygous mutant cells in a limited number of adult fly sensory organs, while the rest of the organism remains heterozygous. These MARCM flies readily survive until adulthood, yet the bristles are homozygous for the lethal genes of interest. MARCM allows for regions of homozygous mutant cells to be generated and marked by the expression of green fluorescent protein (GFP), while the rest of the organism remains heterozygous at that particular locus and unmarked9. MARCM combines individual p-element mutations with five common genetic elements: GFP under the control of an upstream-activating sequence (UAS-GFP), Gal80 repressor protein under control of a general promoter (tub-Gal80), Gal4 transcription factor under control of a general promoter (tub-Gal4), the FRT recombinase enzyme expressed through a heat-shock controlled promoter, and a FRT recombination site10. By driving mitotic recombination through a heat-shock activated recombinase, a limited number of cells are made homozygous for the mutation and marked with GFP. GFP expression is repressed in heterozygous cells by the presence of Gal80 on the wild-type copy of the chromosome. A heat-shock protocol for MARCM was optimized to induce recombination in the fly bristle external sense organs, while much of the organism remains heterozygous, and thus unmarked with GFP. Mosaic flies generated using this protocol contained homozygous mutations most frequently in the post alar or dorsal central bristles on the surface of the notum. We have tested the utility of this combination of MARCM and the grooming behavior screen with a known mechanosensitive mutant, NOMPC. The ion channel, no mechanoreceptor potential C (NOMPC), is an essential component of the mechanotransduction pathway in Drosophila5,11-13. NOMPC belongs to the transient receptor potential (TRP) superfamily of cation channels5 and satisfies all of the criteria to qualify as a mechanosensitive channel in Drosophila14,15: 1) NOMPC is expressed in the ciliate tips of type 1 sensory neurons of Drosophila 13,16-18, 2) NOMPC null larvae do not have an electrical response to tactile stimulation13, 3) Ectopic expression of NOMPC in touch insensitive cells can induce sensitivity to mechanical stimulation13, 4) heterologous expression of NOMPC in Schneider 2 cells yields a mechanosensitive channel13, and 5) NOMPC adult mutants display defects in their response to mechanical stimulation5. Given this evidence, we predicted that NOMPC mutant clones would show an altered or inhibited grooming response in response to mechanical stimulation of bristles. A MARCM-stock containing the NOMPC mutation was developed for use in a proof of principle experiment of the grooming assay. 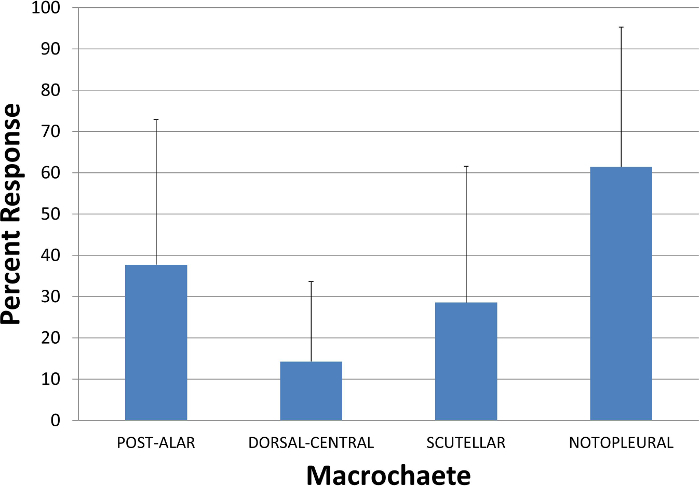 Mosaic flies were stimulated at macrochaete bristles containing homozygous NOMPC mutant cells. We expected an inhibition of the grooming response following stimulation of the macrochaete bristle. We found that only 2 of 14 mutant bristle flies tested gave a single response to repeated stimulation; most did not respond to stimulation of the homozygous mutant bristle. Having confirmed that this MARCM-based behavioral assay produces an abnormal grooming reflex in a known mechanosensitive mosaic mutant, this technique can be used in a screen for additional mechanosensitive mutations. Maintain flies on cornmeal molasses media (6.5 g/L agar; 23.5 g/L yeast; 60 g/L cornmeal; 60 ml/L molasses; 4 ml/L acid mix; 0.13% Tegosept) or standard Drosophila media at 22 degrees Celsius in a 12-hr light/dark cycle. Note: A Lower than standard temperature is used to keep MARCM-stocks healthy. This extends the developmental time between egg and adulthood to 14 days. Use virgin females (approximately 1 - 8 days old) from a MARCM-ready stock containing the necessary genetic elements (GFP under the control of an upstream-activating sequence (UAS-GFP), the Gal80 repressor protein, the Gal4 transcription factor, a heat-shock driven recombinase, and a FRT recombination site). Note: Our MARCM ready-stocks contain the following genotypes: elavGal4, UAS-CD8-GFP, hs-flipase; FRT40A, tubGal80/CyO; tubGal4/TM3Sb. Note: The specific FRT site will depend on the location of the mutation in the genome. For example, FRT40A is used to test mutations on the left arm of chromosome 2, such as NOMPC (see10 for more details on MARCM protocols). Cross MARCM-ready virgin females to males that contain a mutation of interest and its corresponding FRT site (for example, w-; NOMPC3, FRT40A/CyO; +/+). To control for effective MARCM induction, set a second cross using male flies containing the same FRT site, but without a mutation. Use an approximate ratio of 5 females: 1 male in crosses. After allowing flies to mate for at least one night, move adults into new vials with fresh media. Allow flies to lay eggs in a dark environment for approximately 4 hr before again transferring the crosses into new vials. Note the start and end times of the egg laying period. Note: Shorter intervals are acceptable when there appears to be a high number of eggs on the media before the end of the 4-hr interval. Keep vials with a sufficient number of eggs (approximately greater than 20) and store in a 12-hr light/dark cycle at 22 degrees Celsius to be heat shocked later. Note: Vials with a low number of eggs on the media (less than approximately 20) are unlikely to yield sufficient numbers of adult flies for behavioral testing and in the interest of efficiency it is recommended they not be retained for further testing. Note: Our flies are raised with the lights on from 8 AM to 8 PM. We have found the evening time points lead to higher egg densities, therefore usually perform timed crosses between 4 - 8 PM and 8 PM-midnight. The flies lay their eggs at RT in a dark cabinet and then are returned to the incubator the following day so as not to disturb the regular light-dark cycle in the incubator. Approximately 85 - 100 hr after egg laying, place vials into a water bath at 37 degrees Celsius for 1 hr. Ensure that the water level reaches above the height of the media in the vials, but does not fully submerge the vials to prevent the larvae from drowning. Remove vials from water bath and allow a 1 hr recovery period at RT. Place vials back into 37 degrees Celsius water bath for 1 hr. Remove vials from water bath and store in incubator on 12-hr light/dark cycle at 22 degrees Celsius until eclosion. Following eclosion, anesthetize flies on ice. Select flies with genotypes that contain all the genetic elements for MARCM and indicate GFP expression-marked clones will likely be observed based on the observable phenotype markers used in the parent stocks. Decapitate flies with iridectomy scissors. Note: For example, we selected for flies without the genetic markers CyO (curly wings) and Sb (stubble bristle) to identify flies that would contain all the genetic elements necessary to create mosaic regions marked with GFP. Note: Decapitation is necessary to prevent the adults from flying away when stimulated. Place headless flies in a closed, moist environment and allow approximately 10 - 20 hr of recovery. Only use flies that right themselves when perturbed for further testing. Test flies within 30 hr of decapitation. By observing decapitated flies under a fluorescence dissecting microscope, identify homozygous clones marked with GFP at the bristle external sensory organs. Record the bristle name and left or right side. To eliminate any potential bias, the lab member performing the bristle stimulation should be blind to the genotype of the bristle, wild-type or mutant. Elicit a grooming reflex by deflecting the GFP marked bristle towards the fly body with a stiff hair or fine forceps and observe the leg response. Give a score of one to flies that lift their leg in response to bristle stimulation and a score of zero to flies that do not move their legs. Note: Previous studies6,7 have characterized the leg response that is elicited by stimulating a particular bristle. This includes the leg that responds to each bristle and the proportion of flies that respond to stimulation of that particular bristle. We only scored for movements of the leg that we expected to respond based on Vandervorst's classification6. Conduct five trials spaced 2 min apart. The success of this protocol largely depends on the overall yield of testable flies, the effectiveness of the heat shock to induce mitotic recombination, and the ability to obtain a robust behavioral response in flies stimulated at 2 min intervals. Given that an estimated 12.5% of embryos contain the necessary MARCM elements and an estimated 16.67% of adults that eclose have the potential for GFP expression, it is critical to obtain a high number of eggs during timed lays. An example of a successful timed lay over a 4 hr interval that would be used in the rest of the protocol is shown in Figure 1A. When the heat shock is performed 85 - 100 hr after egg-laying, the yield of GFP labelled external sense organs is highest, with most flies having one of the macrochaetae labelled. Numerous areas of interest may contain homozygous cells at the bases of testable bristles when heat shocks are performed within this time period, with the dorsal central and post-alar bristle being found labelled most frequently (Figure 2A). Time points outside of this window result in patches of GFP expression outside of the body regions of interest or no GFP expression (Figure 2B). Flies naturally respond to a looming stimulus by initiating an escape response19. In order to prevent flies from escaping, we decapitated flies. The grooming response circuit remains intact in the ventral nerve cord5. Flies do not recover well if decapitated under carbon dioxide anesthesia, but recover in a few hours when decapitated with cold anesthesia on ice. After decapitation, flies should be stored in an enclosed, moist environment during the recovery period to prevent desiccation. While some flies may desiccate or be unable to stand (Figure 1B), only those able to stand (Figure 1C) are used for testing. Prior to testing, flies are checked for general responsiveness by watching for movement after a touch to the notum. Many flies remain responsive for several days, but testing should be completed by 24 - 36 hr after decapitation. Fly hyperactivity can be a problem during behavioral testing because an observer may have difficulty distinguishing between a true stimulus-dependent grooming response and general movements of the fly. In animals with excess movement not elicited by tactile stimulation, more reliable results are achieved by waiting for hyperactive flies to become quiescent. We found that 47% of wild-type flies respond at least once when touched on a bristle five times, spaced at 2 min intervals to prevent habituation. Several groups have shown that stimulation of different bristles elicits a patterned response from a specific leg 6,7. Of the bristles that do elicit a grooming reflex following stimulation, the percentage of flies responding ranges from 38% (anterior scutellar) to 94% (anterior noto-pleural)6. In our experiments, wild-type control flies responded to a light touch from 14% (dorsal central) to 86% (noto-pleural) of trials (Figure 3). In a MARCM-based screen with unknown mutants, those flies containing a mutation not involved in mechanosensation can be expected to exhibit a reliable behavioral response similar to that observed in wild-type control animals. The known mechanosensitive mutant, NOMPC disrupted the grooming response as expected. Control flies responded to bristle stimulations at homozygous cloned post-alar bristles 37% of the time (Figure 4). In contrast, animals with bristles that were homozygous for NOMPC responded 2% of the time (Figure 4). While wild-type flies respond differently to stimulation of different bristles, these results suggest that a mechanosensitive mutation, such as NOMPC, nearly eliminates the grooming response. In a screen with unknown mutants, several mutations involved in mechanosensation that inhibit the grooming response are expected. Figure 1. Proper Rearing Conditions are required for Optimal Behavioral Testing. (A) A sufficient number of embryos are needed following the 2 - 4 hr egg laying period. The number of embryos after a 4 hr timed lay is likely to yield a sufficient number of adult flies for behavioral testing. (B) During the recovery period following decapitation, some flies do not survive and cannot be used in further testing. (C) A decapitated fly that was properly stored in a moist environment during the recovery period is testable in a behavioral assay. Please click here to view a larger version of this figure. Figure 2. MARCM Clones in Bristles when Heat-shocked between 85 - 100 Hr After Egg-laying. (A) GFP expression in adult flies when heat shocked 98 - 101 hr after egg laying. As many as 10 macrochaete bristles contain homozygous mutant external sense organs and are appropriate for testing in the grooming response behavioral assay. (B) GFP expression in adult flies when heat shocked 161 - 164 hr after egg laying. Note the lack of GFP expression at the bases of the macrochaete bristles, indicating no patches of homozygous cells at a testable external sensory organ. Please click here to view a larger version of this figure. Figure 3. The Frequency of Response to Tactile Stimulation is Dependent on Bristle Identity. The total number of responses of an individual fly to stimulation of a single bristle was divided by the number of stimuli to give a percent response. Percentages were averaged for each bristle (N = # of flies tested, 22 Post Alar, 21 Dorsal Central 14, Scutellar, 7 Notopleural). Please click here to view a larger version of this figure. Figure 4. NOMPC Mutants Do Not Respond to Tactile Stimulation. Stimulation of the post-alar bristles elicits a response in wild-type MARCM clones. However, stimulation of MARCM clones on the post alar bristles that were NOMPC3 -/- (green bar) resulted in few responses (N = 23 wild-type, and 12 NOMPC -/-). Please click here to view a larger version of this figure. This protocol utilizes an adult behavioral assay to screen for mutations that affect mechanosensation in Drosophila. 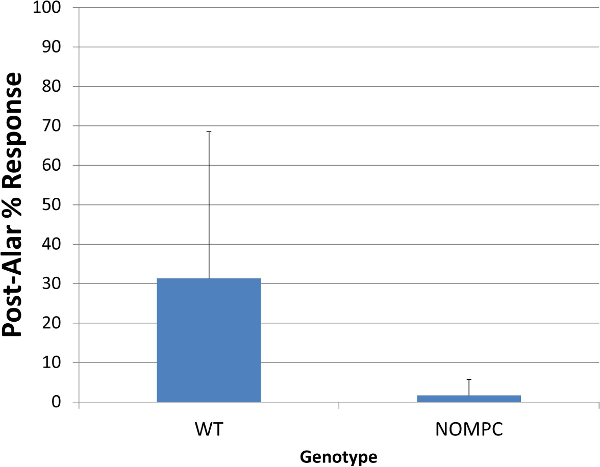 Because the collection of mutants contains lethal p-element mutations that would preclude screening as adults, this protocol makes use of a complex genetic technique first described by Lee and Luo, (1999) and detailed as a protocol by Wu and Luo, (2006) to circumvent adult lethality. MARCM induces mitotic recombination between homologous chromosomes to generate clonal regions of homozygous cells. These regions are marked with GFP because of the loss of the repressor protein, tub-GAL80 that occurs during mitotic recombination. By using MARCM to generate cells which are homozygous at a particular genetic locus, gene function can be studied in adult flies using a variety of methods, including the behavioral assay described in this paper. The primary factor limiting both the number and the specific genes that can be tested is the presence of a FRT site within the genome of the fly. Fly stocks must contain a FRT site on the chromosomal arm of the mutation of interest. MARCM ready fly stocks must contain an identical FRT site as the mutant chromosome to allow for mitotic recombination. In our lab, we developed fly stocks containing MARCM backgrounds with FRT40A and FRT42D sites. These stocks will allow us to screen any adult lethal p-element already combined with a corresponding FRT site on the 2L and 2R chromosome arms, respectively. To maximize the potential of MARCM in screens for mutations that affect mechanotransduction or the grooming reflex, additional fly stocks with MARCM backgrounds capable of testing genes on both arms of the third chromosome and the X chromosome will be created. Once developed, these stocks will allow for most adult lethal p-element mutations combined with a FRT site to be tested for involvement in mechanosensation. The timing of the heat shock protocol has been developed to maximize the number of homozygous cell regions at the external sensory organs, while leaving much of the rest of the fly heterozygous at the locus of interest. Numerous areas of interest can be marked by GFP expression following a double heat shock, allowing for multiple bristles to be tested (Figure 2). The MARCM protocol provides an excellent opportunity to create homozygous lethal mutations in specific regions of interest, but our MARCM protocol relies on the heat shock induction of recombinase activity, making it a random process as to which bristles will ultimately be testable. Because each bristle elicits a specific leg grooming reflex6,7, it was important for us to confirm that the responses in wild-type MARCM clones are comparable to those previously described. Maximizing the efficiency of a MARCM-based screen requires the ability to test any of the macrochaete bristles for a mutant response and to compare these data against the response rate from a corresponding bristle in a MARCM-ready stock. We have confirmed the results of Corfas and Dudai7 in bristles expressing GFP in the MARCM flies. The ability to readily distinguish between normal and abnormal fly behavioral responses is critical to determine which mutations interfere with mechanotransduction. A mutation in a gene involved in mechanotransduction or other aspect of the grooming reflex should inhibit the leg response; a significantly lower response rate at the corresponding bristle in a MARCM-ready stock is expected. The behavioral response rates in mosaic NOMPC and wild-type flies serve as a proof of the principle that the MARCM-based behavioral screen can be used to differentiate between mechanosensory mutants and normal flies. We have shown that in NOMPC mutant mosaic clones, the grooming reflex in response to bristle stimulation is nearly abolished. Only two flies of the fourteen tested exhibited a leg response. Each of these flies responded only once over the course of testing, suggesting that a MARCM-based behavioral assay is effective at identifying a mechanosensation defect. An observer can distinguish between mechanosensitive mutant flies and flies without a mutation or with a mutation that is not involved in the grooming response. Because of the high degree of variability in wild-type responses, the screen will identify strong alleles, but will likely miss more subtle changes in behavior due to weaker alleles. 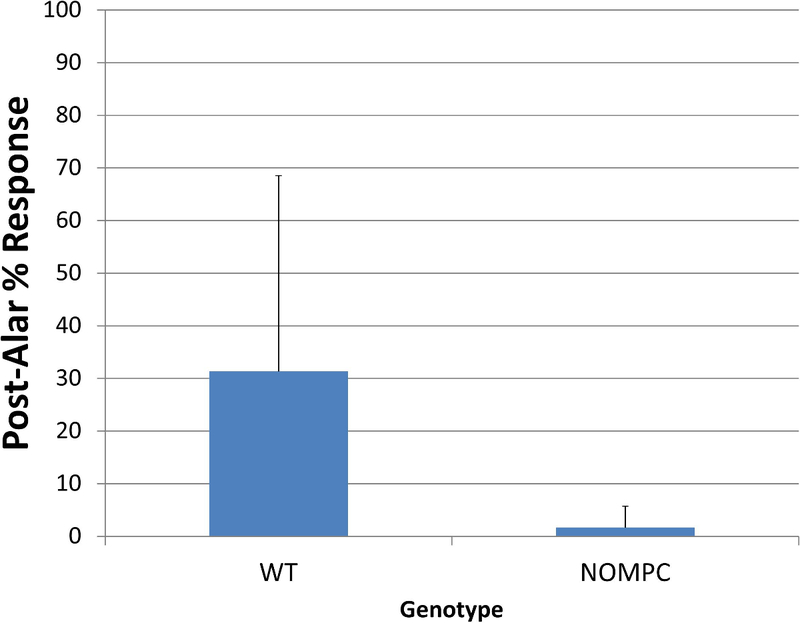 The collection of mutants to be screened includes only homozygous lethal alleles, so it is likely that these are strong or null alleles and are likely to abolish protein function. However, the screen would miss alleles that may be lethal in development, but produce a more subtle mechanosensory defect when made homozygous in a more limited manner by MARCM. We chose an all-or-none scoring system for simplicity. This method yields a generous score compared to the system used by Corfas and Dudai7 that assigns a score of 0 - 4 depending on the extent of the leg movement. In the all-or-none system, any response is given full credit with the assumption that any response to stimulation indicates that the sensory system is detecting the stimulus and signaling to the motor system. This screen may identify mutations that affect any step in the behavioral circuit. Further testing, such as electrophysiology (as in Kernan et al5) or calcium imaging, would have to be used to determine whether the mutation directly affected mechanotransduction or some other aspect of the development or function of the sensory-motor reflex arc. Drosophila melanogaster provide an excellent model system for the study of mechanosensation. The external sensory organs share many structural and functional similarities with the hair cells of the mammalian inner ear20. Elucidation of the molecules involved in this process in Drosophila has the potential to reveal mammalian homologs and orthologs. Screens aimed at discovering mutations that disrupt mechanosensation will pave the way for subsequent cell biological, electrophysiological, and biochemical studies to further identify and characterize these molecules, deepening our understanding of this process in both flies and mammals. A MARCM-based screen for mutations affecting mechanosensation will use a well-established genetic technique paired with a grooming response behavioral assay to reveal new genes involved in mechanotransduction and the fly grooming reflex. The authors would like thank the Bloomington stock center, Liqun Luo, Charles Zuker, and Lily and Yuh Nung Jan for the generous sharing of fly stocks and the following for funding: SOMAS-URM (to JD and SW), Bachelor Ford Faculty Summer Fellowship (to SW), BD Corporation Summer Research Fellowship (to CL and DL), The Renee and Anthony M. Marlon, M.D. '63 Summer Research Fellowship (to DL)James C. '75 and Jane Colihan Summer Research Fellowship (TO) through the Alumni/Parent Summer Research Fund of the College of the Holy Cross and the Stransky Foundation Summer Research Fellowship (to TO). Special thanks to the Department of Biology and the Dean's Office at College of the Holy Cross for the support of all the work in the lab. Grünert, U., Gnatzy, W. K+ and Ca++ in the receptor lymph of arthropod cuticular mechanoreceptors. J Comp Physiol A. 161, 329-333 (1987). Kernan, M. J. Mechanotransduction and auditory transduction in Drosophila. Pflugers Arch. 454, 703-720 (2007). Gillespie, P. G., Walker, R. G. Molecular basis of mechanosensory transduction. Nature. 413, 194-202 (2001). Corfas, G., Dudai, Y. Adaptation and fatigue of a mechanosensory neuron in wild-type Drosophila and in memory mutants. J Neurosci. 10, 491-499 (1990). Kernan, M., Cowan, D., Zuker, C. Genetic dissection of mechanosensory transduction: mechanoreception-defective mutations of Drosophila. Neuron. 12, 1195-1206 (1994). Vandervorst, P., Ghysen, A. Genetic control of sensory connections in Drosophila. Nature. 286, 65-67 (1980). Corfas, G., Dudai, Y. Habituation and dishabituation of a cleaning reflex in normal and mutant Drosophila. J Neurosci. 9, 56-62 (1989). Chen, J., et al. Discovery-based science education: functional genomic dissection in Drosophila by undergraduate researchers. PLoS Biol. 3, e59 (2005). Wu, J. S., Luo, L. A protocol for mosaic analysis with a repressible cell marker (MARCM) in Drosophila. Nature Protocols. 1, 2583-2589 (2006). Eberl, D. F., Hardy, R. W., Kernan, M. J. Genetically similar transduction mechanisms for touch and hearing in Drosophila. J Neurosci. 20, 5981-5988 (2000). Walker, R. G., Willingham, A. T., Zuker, C. S. A Drosophila mechanosensory transduction channel. Science. 287, 2229-2234 (2000). Yan, Z., et al. Drosophila NOMPC is a mechanotransduction channel subunit for gentle-touch sensation. Nature. 493, 221-225 (2013). Arnadottir, J., Chalfie, M. Eukaryotic Mechanosensitive Channels. Annual Review of Biophysics. 39, 111-137 (2010). Christensen, A. P., Corey, D. P. TRP channels in mechanosensation: direct or indirect activation? Nature Reviews Neuroscience. 8, 510-521 (2007). Cheng, L. E., Song, W., Looger, L. L., Jan, L. Y., Jan, Y. N. The Role of the TRP Channel NompC in Drosophila Larval and Adult Locomotion. Neuron. 67, 373-380 (2010). Lee, J., Moon, S., Cha, Y., Chung, Y. D. Drosophila TRPN(=NOMPC) channel localizes to the distal end of mechanosensory cilia. PLoS One. 5, e11012 (2010). Liang, X., Madrid, J., Saleh, H. S., Howard, J. NOMPC, a Member of the TRP Channel Family, Localizes to the Tubular Body and Distal Cilium of Drosophila Campaniform and Chordotonal Receptor Cells. Cytoskeleton. 68, 1-7 (2011). de Vries, S. E., Clandinin, T. R. Loom-sensitive neurons link computation to action in the Drosophila visual system. Curr Biol. 22, 353-362 (2012). Jarman, A. P. Studies of mechanosensation using the fly. Hum Mol Genet. 11, 1215-1218 (2002).